New colors released for the 2017 Yamaha R1. Also, October 11 is the day to get online to order your R1M. Howdy! Robert here. I can already feel it – 2016 is going to be one heck of a year! Some of my personal goals are to ride more often to work (get back to daily commuting on the R1), get in 3 or 4 track days minimum at Circuit of The Americas (COTA) in Austin, Tx and Harris Hill Raceway in San Marcos, Tx and most importantly, do the very best I can to get more content here on the R1Videos.com Videos page and on our social media sites like Facebook, YouTube, Instagram, Twitter, Tumblr, FlickR, and Pinterest. We have big plans to release new videos as soon as we can! My main goal is to work with Todd to get more videos shot and edited, more tips, tricks, and mods posted, some gear reviews up and going for yall and hopefully a podcast or SoundCloud series launched. It’s going to be a big job and take a lot of work, but I’m ready to get back to working on the R1Videos.com project. Now if I can only stick to these New Years Resolutions! Your questions, interactions, and sharing of our content helps to keep us going so we wanted to say thank you for a great 2015 and we wish you safe riding, peace and prosperity in 2016! Robert W. and Todd M.
Howdy friends! We are back up and online again, hopefully with no more down time. We got hacked so it’s been a mess getting everything fixed and untangled. Now we can get back to what we do best and that is bring you more videos and articles and posts about the Yamaha R1. Happy New Year 2015 to all riders world wide. R1 Videos has been going since 2011 and we plan to keep it going forever! Thank you to all R1 Insiders, all readers, all fans, and friends. Yes we have more how to videos to help you work on your Yamaha R1 coming this year. Our goal is to shoot and edit more videos and get them up and online faster! We also plan to do a few gear reviews and riding safety tips videos for yall, as well. Stay tuned, check back often, and make 2015 the best one yet! The 2015 Yamaha R1 has been unveiled! What do you think? Let us know in the comments. Here is the official pic from Cycle World. Here is the rest of the info on the new 2015 R1 over at Cycle World. Just pointing out this great news that GoPro 4 is finally here! Will make for some great videos and riding safety videos. We’ll get back to yall soon with more videos. Did yall know that we keep all R1 videos we release here on our Videos page? Check it out. Velocity Stacks or V Stacks or is it… V-Stacks? How to video is now available to everyone so have at it. Be advised – we have 2 more videos that have been shot and are about mid-way into editing. Plenty more videos to come. We hope to find a way to start getting more how to videos out to you faster. Stay tuned, we have a few ideas! Watch our videos on YouTube, here in the post below, or all on 1 page on our R1 Videos page. Now for the R1 Insiders – sorry for the wait! Without further ado, your access link to the R1 Videos How To Change Velocity Stacks or V Stacks video is on the way to the email inbox you have on file with us as an R1 Insider. Check your email and Get Your Fix! Check out our webpage here on the R1 Videos website where we post all of the videos, and only the videos so you can Get Your Fix! The videos are in order that we released them, and yes, we have more on the way. I will stop saying soon because I still have 3 to finish editing and can’t find the time. As promised, R1Videos Insiders will get the video links first through email as soon as they drop. Anyone can sign up here. Stay tuned, and stay visible! Spent the entire day editing 4 videos – V-Stacks, Air Filters, Remove / Install Gas Tank – and only completely finished the 4th… about uhhhh… May the 4th and JIT. The latest 3 videos should be ready and starting to roll out over the next week or so. We’re excited to be back in action. It’s been a while, but we are serious about keep this project up and running! Stay visible out there and May the 4th be with you! Howdy gang. We actually got 3 new videos filmed last week and are still in the process of editing them. R1 Insiders will get access to them first so if you haven’t yet signed up, it’s quick and easy and on the top right side of the homepage. We will never spam you, sell or rent your info, ever. It’s just a way for us to reach out to you when we have something cool to tell you about, a coupon to save you cash at a motorcycle retailer, or some sort of newsletter if we ever get one up and going. Oh yeah, and to let you know when the latest R1 Videos are ready so you can access them first before they go live to the general public! More blog content coming soon. More pics on our FlickR page, more Pinterest, Facebook, and everything else we can think of to keep you busy with news, updates, and information about the Yamaha R1. Yall ride safe and be easy! PS – we have a long list of videos yall submitted to us so we will always keep working on those – but what else do you want on our sites? There are a ton of ways to interact with us so let us know. Hey everyone, been a while! Still trying to catch up at home so we can both focus on R1Videos again. 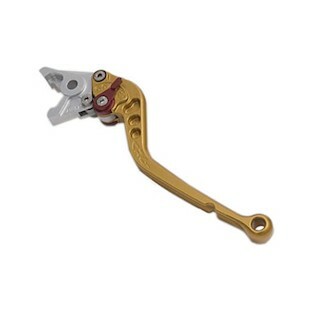 This post is for a YouTuber that commented in wanting to know where we got our gold CRG levers. Well, I can’t recall but I can tell you that if I had to buy them today, I’d get them at RevZilla. Bought some A-Stars gloves from their site a couple months ago and was pleased as usual. So iddtapthat (cool user name by the way) – here are the levers at RevZilla. Just click the image and check em out. We highly rec the “shorty” and not the “standard” length. The shorties are much better and actually safer for you while riding. That’s another story Todd can share some other time, so just trust us – always go with the shorties. So everyone, if you have standard clutch and brake levers, it’s a good time to think about shortening them up. Plus, by clicking the link/image below, you are supporting R1Videos – not by much but every bit helps! Riders and Insiders – what’s goin on tonight? Sorry for the new look and feel of the site. We have a lot of work to do to get a better design going but due to security reasons, we had to abandon the old design. Not sure how I feel about this one. It’s temporary, so I guess it will have to do for now. Yall stay visible out there. We’ll try to stay more visible here and on our YouTube site. We have more videos, but like I’ve said several times – – we’re really busy with work and I’m moving so yall sit tight. I promise more how to vidz are on the way and also some GoPro riding footage and tips and so on. Howdy fellow riders! It’s Wiski here, just wanted to give yall some updates since it’s been a while since we’ve posted and released any new videos. Todd and myself both recently got new jobs with new companies, so getting adjusted has kept us both pretty busy. I am also in the middle of moving out of my rent house and into a more permanent solution so that means R1Videos.com Battle Stations will finally be staying put for longer than a year! This means no more distractions with jobs and finding places to live so we can get back to getting more sportbike videos, how-to videos, and so on filmed, cut, mastered, and released for you guys. We have a long list of videos to produce, pics and posts stacking up, and hopefully deals and/or discounts from some retailers on the way. So if you haven’t already, might as well sign up to be an R1Videos Insider. We will be releasing videos early to those that sign up, and trust me, we hardly ever send send any emails out so there’s nothing to lose. We’d like to get a newsletter going but who has the time!? PLUS – – we will NEVER sell your email address to a 3rd party – EVER – because we hate SPAM just as much as you do. We just want to be able to shoot you an email if we get a special discount or something cool comes along. Guess that’s it. So sorry for the long delay in pushing out new content and new videos covering not only the Yamaha R1, but also gear, riding tips, reviews, and so on ! There is plenty to come when we get a chance to put it together and spit it out so hang in there with us. We are getting back in the saddle soon and will fire things back up as quick as we can! Finally, our latest how to video, How To Remove Install Windscreen Yamaha R1 is finished and ready for the public. We hope this helps you take off that stock windscreen and put on your new after market windscreen on that new Yamaha R1 of yours. Going forward, all videos will be sent out to the R1Videos Insiders first before they go public so sign up! In case you missed it, we have a Videos Page with all our videos in order they were dropped so you can cut to the chase. If you have questions, contact us and I will answer them myself (email Robert) or I will forward them over to Todd (guy in the videos) to get answer for you on anything R1 or gear related. Eventually, I will set up Todd’s email, but that cuts into editing time! Yall be easy out there. Pic of Gary’s 2010 Yamaha R1 From Down Unda! Here is a picture of our mate Gary’s R1 from The Out Back! It’s long over due, and we apologize for the darn near half year delay, but definitely wanted to share his pics of his new 2010 R1! Thanks Robert Free support for the R1 Thank You. Love this bike so much, I have carbon fibre pipes on it now and it goes like a rocket. Haven’t really been able to use all the house power it has as the roads in Brisbane are in bad repair after the flood. Also I’m worried about losing my license on it, and that would kill me. Believe me when I say that this could have happen so many times now, but I’ve been lucky. I’m always clicking up to the next gear and backing off in amazement of the power it has. I’ve read the reviews and I don’t care what they say, this bike is all that I want. Excellent workmanship and I only wish we could build something like this here in Australia. Plugs this weekend and a new K&N air filter, I’m going to be in trouble. Robert here (aka Wiski) – just thought I’d share this short clip from a video I shot on my first track day ever last year. I’m on the wall at Texas World Speedway trying to get low enough to get as much as I can on the wall. This is not the How To video we just released yesterday. That one is only for R1Videos Insiders for the time being. It’s free, quick and easy to sign up for future videos so sign up to be an Insider here. Anyways, I shot this video with my GoPro HD Hero2. I used the Drift external microphone to record my voice while on the bike. Oh yeah, the GoPro is mounted on my helmet upside down using my own method. You can see how we did the GoPro helmet mount in this post. So the video will give you a basic idea of the resulting video footage. However, that’s on a track – it looks better when riding in a normal riding position and not tucking in so low. I’ll post another video vlog from the normal riding position soon so you can see how that looks also. What up fellow R1Videos.com Insiders! We just wanted to let everyone know that we are about to drop a new how to video. It will only be available to those of you that signed up to join us as R1Videos.com Insiders. You will be able to view the videos from now on, first – before we drop the video to everyone else. So if you haven’t already, join us today! R1Videos.com Insiders is a project we are working on to bring you value as a fan of our website. We do not share or give out your email or any info. If there is something you should see, or a new video we drop, we want to hook up the Insiders FIRST! We are also working on getting some good sportbike coupons from a few top notch vendors to send your way (if anyone will give us any to share that is)! So anyways, join us now, you won’t be sorry. Painted my wheels green (forest green) on my 2004 Silver Yamaha R1. The color looks a tad bit blue from the camera and the white, winter, late-afternoon sunlight. But in better sunlight, my wheels look more black with deep hints of green. I thought I would share because when I was thinking about what color would go with the Silver R1, I couldn’t find any pictures with green wheels. I also posted this pic to our Facebook page here so you can chime in and tell me if you like the green wheels on the silver R1. Or, tell me what I should have gone with instead, or even hate on it. Find more racing schedules here on our R1Videos.com Race Calendars page. Find old race schedules and current race calendars.